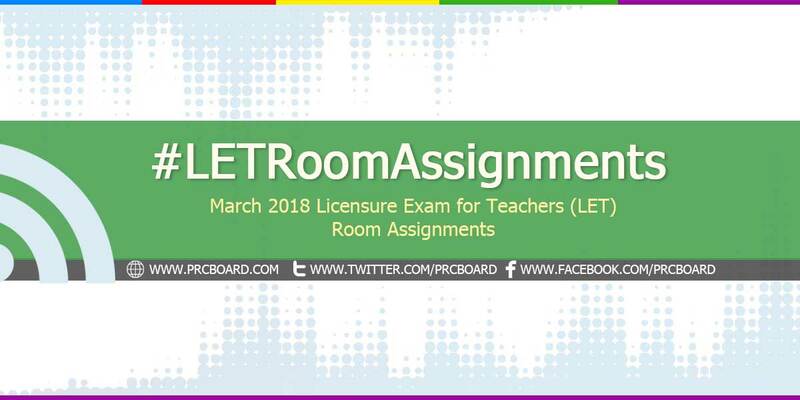 MANILA, Philippines - The Room Assignments for March 2018 Licensure Exam for Teachers (LET) board exam for both elementary and secondary levels are expected to be released by the Professional Regulation Commission (PRC) Board of Professional Teachers few working days before the exams. The first schedule of LET for the year 2018 is scheduled to take place on March 25, 2018 at PRC testing centers specifically in Manila, Zamboanga, Bacolod, Rosales, Pangasinan, General Santos City and all Regional Offices nationwide. Pursuant to PRC Resolution No. 2018-1077, series of 2018, Palawan, Rombon and San Jose, Occidental Mindoro were included in the list of March 2018 and September 2018 LET testing locations. This page will be updated soon as room assignments at designated testing locations are already available. You may go back to this page for updated info. To receive regular updates about March 2018 LET board exam results as well as other related announcements, you may refer to our social media pages via Facebook and Twitter. hi.. i lost my NOA.. ano po pwde gawin?? Sa march 25 na pa naman ung exam.. Please help..
Tanda nyo po yung number nyo sa NOA nyo? How about in kidapawan city? anghirap po maghanap sa list ng mag-eexam sa Baguio. minsanan sya. sobrang haba ng list. hindi mai-load ng browser. good day po. Paano po makikita yung room assignment po ng zamboanga po? help naman po thank you po. WHAT ABOUT ROOM ASSIGNMENTS FOR KIDAPAWAN CITY?? What About Pagadian room assignment?? Anyare sa zamboanga Mapeh?? Bakit di ma open and minsan nmn file not found.